DwellStudio is a real Canadian success story. Barbara did a great interview with founder and designer Christiane Lemieux in her fabulous So Canadian, Eh? series. Christiane worked closely with The Bay to create the settings you see here. I think my favourite might be A. 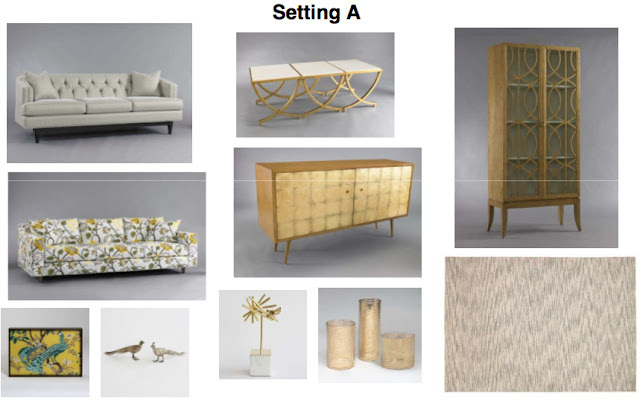 Or C. Or maybe D.
The DwellStudio products have a retro vibe that reminds me of classic furniture from the 60's and 70's. But paired with really modern fabric patterns, the look is fresh and current and works well in traditional or modern spaces. I especially love their geometric fabrics, like the Gate Citrine fabric we have on our living room chairs from Crate & Barrel. 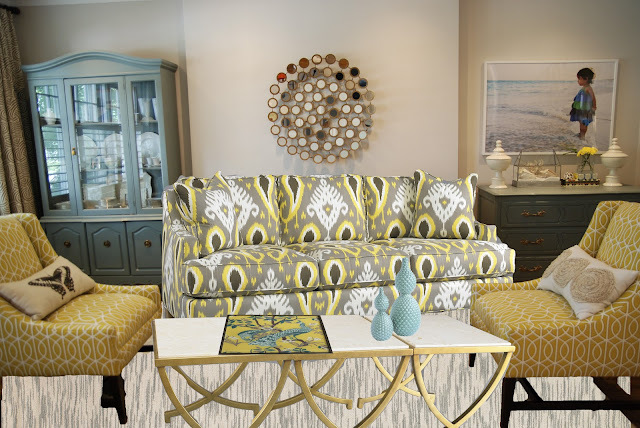 I've been waiting to see the DwellStudio sofas because once the basement is finished, we'll be moving the living room sofa downstairs and will have to get something new for upstairs. Seeing as we already, have the DwellStudio fabric-covered chairs, one of their sofas might feel right at home in our living room, don't you think? wow! That sofa does fit in and so do the coffee tables and accessories. Did you notice how the colours even work with my blue hutch and dresser? :) I think I'll have to take a closer look at these in store. The DwellStudio products are available in The Bay flagship stores on Queen Street Toronto, Vancouver, and Montreal now, with more stores planned. If you're looking to up the style quotient in your home, you might want to pop by The Bay for a look! Yay! I too love Dwell Studio. 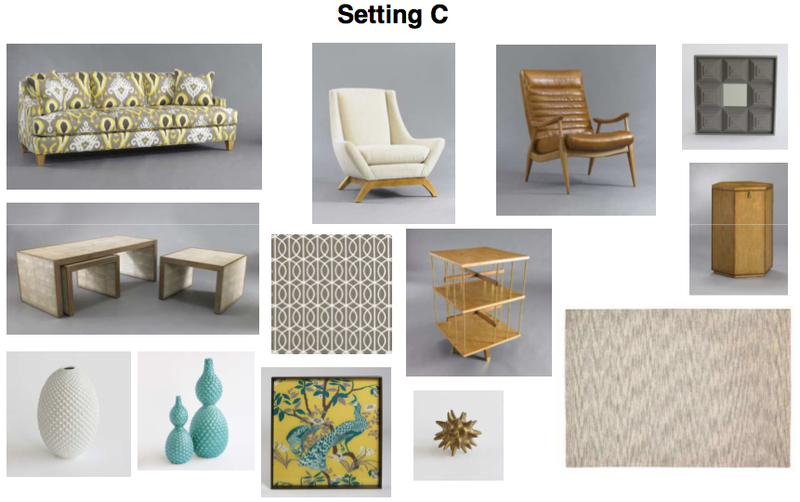 Love the leather chair in "C" and the little gold side table in "D". And that sofa does look good in your living room. I LOVE their furniture line- desperate for that gold little sculpture in the first board. And yes, that sofa would look amazing in your room! And PS, can you please tell me how to use Photoshop- I've had it for two days and can make zero sense of it. Love your posting and the setting arrangements of tables, sofas and chairs. Thanks for sharing. I love the sectional in D... very nice. 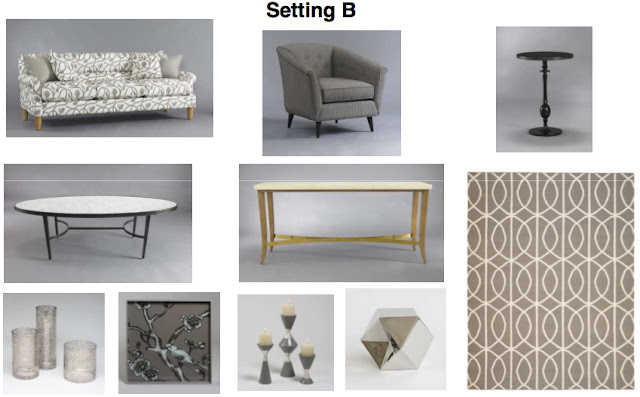 Just starting to see what Dwell Studio has to offer! I feel like I am behind..
LOVE everything about Dwell Studio! I didn't realize they were a Canadian company! Hope they are in Calgary Bay stores soon! That leather chair does look sumptuous. I'm not usually a fan of leather but I like the masculine, clean lines of this one! I could totally picture their furniture in your place! They didn't have all the pieces in store last week so you might want to wait a bit before you go. Yay! The Bay is really stepping up their game lately, love it. I'm really loving that couch in your space, totally matches the chloe chairs. 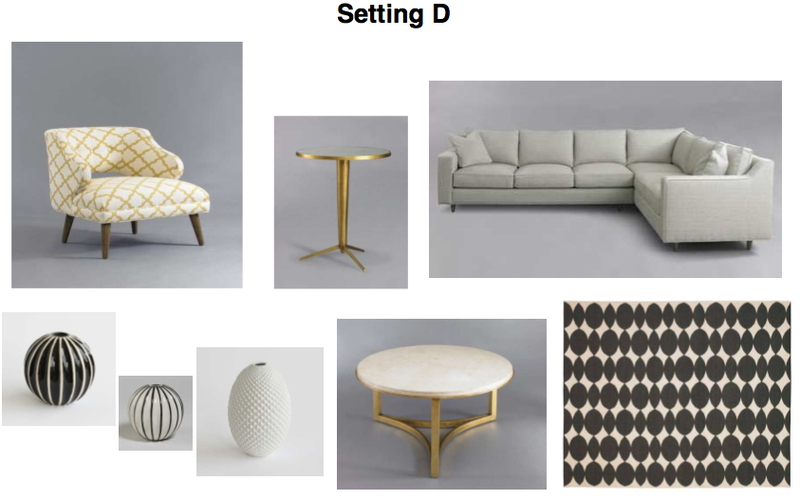 I've been looking for a sectional and really like that one in setting D - now hurry up and come to the Edmonton store, Dwell! really nice but, I can only imagine how $$ the will be @ the Bay..
Actually, that stuff is more 50s - 60s. Nothing 70s in there that I can see [been there, *lived* through them all!]. And, I'd go with a SOLID - [try a deeper shade of BLUEs already in the room] - coloured Sofa since the chairs are Patterned. It's way LESS costly to accent with "Trend"-Pattern-of-the-Month-PILLOW-COVERS than re-upholstering *every* Year! That sofa would be perfection! Thanks for the shout-out! And yes, I live C and D!! Can't wait to check it out at The Bay. The nesting coffee tables in setting C have been on my wish list since they launched in the U.S. Exciting!!! Oh, please come to Ottawa ASAP!!!! I love Dwell. Love, love, love! 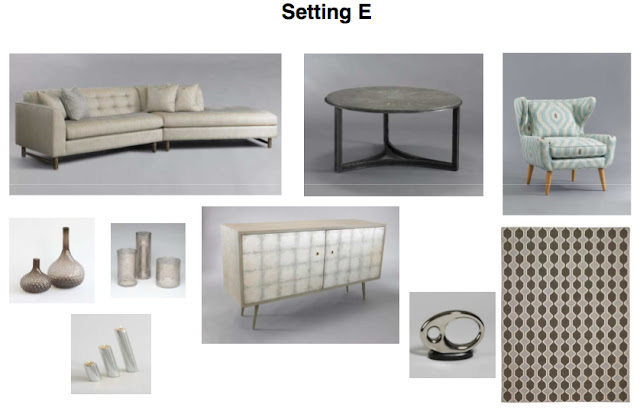 I love the gray and white sofa in setting B! The yellow from setting C is so beautiful too and you're right, it and the coffee table & accessories look perfect in your living room with the existing furniture!